USB-C is becoming more prevalent, so we’re also starting to see more USB-C accessories. Chargers with USB-C are handy, because you can not only use them with your iOS devices, but you can also give your MacBook a bit of juice when you can’t find a power outlet. The 6,800 mAh Nifty Mobile Charger ($80; available on Amazon) is one of the newest USB-C chargers to hit the market. According to the company, the Nifty has a maximum output of 15 watts for its USB-C port and 18W for its USB-A port. If you need to charge an Android phone, you’ll be glad to hear that the Nifty supports Qualcomm Quick Charge 3.0 for fast charging. The USB-A port can feed 2.1 amps to iPhones and iPads. To test the Nifty, I used it several times to charge a fully-depleted battery in an iPhone 6s Plus. On average, it took 45 minutes of charging for the iPhone battery to reach 50 percent capacity. After 100 minutes, the iPhone 6s Plus was 90 percent charged. For comparison using the 5-watt charger that Apple includes with the iPhone, the battery charged to 80 percent after 120 minutes. The NIfty has a USB-A and USB-C port. With the iPad mini 4, the Nifty charged the tablet to 21 percent after 30 minutes. After 100 minutes, the iPad mini’s battery reached 78 percent, and the Nifty was out of power. 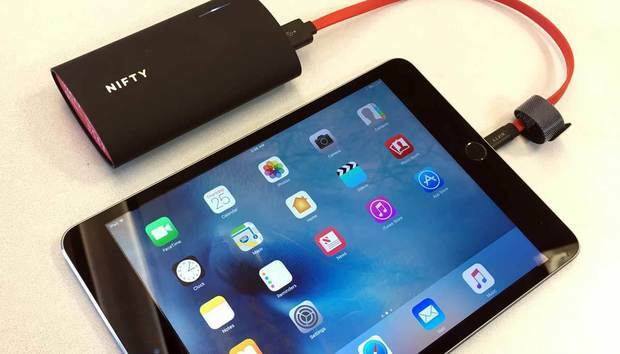 For comparison, the iPad mini reached 83 percent after 120 minutes when using the 10-watt Apple charger. For kicks, I also tested the Nifty with the 15-inch MacBook Pro, even though the company doesn’t specifically state that it supports that laptop. The Nifty is smaller than other USB-C batteries that we’ve reviewed that are designed with large power capacities to provide a considerable amount of charge to a laptop. (I wasn’t able to procure a 12-inch MacBook for testing.) After 70 mintues, the depleted MacBook Pro was charged to 19 percent and the Nifty was out of power. The Nifty is also able to charge two devices at once, with one device connected to the Nifty’s USB-C port, and another device connected to the USB-A port. The company uses technology it calls Intelligent Variable Output Delivery to determine which device should have priority. With the Nifty sitting so that its logo reads horizontally, the 0.35-pound device measures 2.3 x 4.2 x 1 inches. A five-point indicator light gives you a visual clue to the amount of charge left in the Nifty. The device itself is available in Signature Stone Red, Stone Gray, and Suede Black. Includes in the box are a 3-foot USB-A to USB-C cable, a 1-foot micro USB cable, and a micro suede pouch for stashing the cables. The cables are flat so they’re less prone to tangles, and the company says that the cables are 240 times more durable than other cables. A 1-foot USB-A to Lightning cable is sold separately for $20 and will be available by the end of May. The Nifty Mobile Charger comes with a USB-A to USB-C cable (left) and a MicroUSB cable. If you consider some of the other USB-C batteries we’ve reviewed, the Nifty’s main drawback is its price/capacity ratio. For example, in our USB-C battery roundup our top choice, the Anker PowerCore+ 20100mAh USB-C Port Portable Charger, has nearly three times the capacity as the Nifty, and is available for $85 on Amazon. However, these larger-capacity batteries are touted more as MacBook batteries, while the Nifty is targeted towards mobile phone users, so its smaller size makes it a better phone companion. The Nifty Mobile Charger is well designed and its ability to charge an iPhone at a faster rate than Apple’s 5-watt adapter is great. You can find other USB-C batteries that can hold more juice at a similar price, but they aren’t as portable as the Nifty.